I must admit that I’ve been on BART (Bay Area Rapid Transit) more times than I’ve been on the Metro in Los Angeles (My one and only time was with my guy when we rode to the Wilshire iteration of CicLAvia a couple years ago). It’s a shame, too, because the Blue Line is just a few blocks away from my apartment. But I digress. Last week, I had the chance to go out and about on a tour of the Metro Expo Line extension that’s opening up to Santa Monica, which is promising because my job is a short walk from one of the new stops. Maybe I’ll use that to get into work? We’ll see, but it was exciting to observe all the sights along the way. Click through the slideshow to see all the fun things I encountered on the train ride. Starting from the Culver City stop and going all the way to the Downtown Santa Monica stop (right at the intersection of Fourth Street and Olympic Boulevard, a short walk to the pier/beach and Third Street Promenade), I was amazed by the architecture of some of the older buildings, the growing list of places I’d like to visit, the hidden pieces of street art and murals peeking out unexpectedly. It all added to the wonder and surprise of getting an exclusive behind-the-scenes look at the Metro’s new line. There was a dope Obey mural that I didn’t get to capture, and getting that on camera may be worth another trip alone. I was particularly impressed by the art adorning the different stops, each unique and highlighting a diverse subject. There were piles of artistically scattered clothes and more intricate tile works of the iconic Far East. It makes for great scenery to sit back and enjoy while on board. To see what other adventures I’ve gotten into, click here to read more Out and About posts. I’ve always heard great things about the Getty Villa, but for whatever reason hadn’t ever gotten around to going. I got the chance to visit this Malibu/Pacific Palisades-area museum this past weekend when my friend Fifi celebrated her birthday there. It was a perfect Los Angeles day: not too hot, not too cold. I’m more of a contemporary art kind of gal, but it was nice to get out of my comfort zone and explore an entirely different era of art. Ancient Greece and Rome, to be exact. And you can see it all by clicking through the slideshow. There was so much beauty everywhere I looked, from the statues, statuettes and busts in bronze and marble, to the vases, to the architecture, to the gardens and flora inside. Even the floors and ceilings were a sight to behold. I also learned that a lot of those creepy, eerie dead eyes (you know the kind that follow you wherever you go?) were made of bone, stone and glass to resemble real eyes. Like, they’re intentionally that way. I guess you can say beauty is in the EYE of the beholder. See what I did there? I highly recommend making the trip to the Getty Villa (ticket reservations are a must), and while you’re on that side of town, try that new brunch spot you’ve heard rave reviews about. “This is our tiiiiiiime!” It truly was this past Tuesday, as my pals Linda, Lola and Octavia headed to Warner Studios in Burbank for the taping of daytime talk show “The Real.” I was extra amped because it was one of their holiday episodes. I had no idea what to expect, but shortly after arriving at 7 a.m. or so and waiting in the check-in line, I became a contestant on the “Fake It or Take It” game. I guess I had the right blend of zaniness, energy and style, because the producers picked little ol’ me out from dozens of audience members to play the game. No spoilers here. I’ll let you see how I did, right here. I hadn’t been to a TV show taping since “The Price Is Right,” and it was exciting being in the audience and seeing what goes on behind the scenes. Tamar was out sick, but Tamera, Loni, Jeannie and Adrienne held it down. The whole experience was awesome. You can tell that there’s an amazing team that makes the magic happen, and seeing it firsthand made me like the show even more. Friends, if you’re ever itching to go to a show taping, get in on “The Real”– you won’t be disappointed. Everyone, audience members included, was supportive, friendly and there to have a great time. So glad I got to experience it. Rewind to last October when I won a staycation at the Ace Hotel Downtown L.A. after dancing for my life at 826LA’s Dance-a-thon and being crowned Best Dancer. Welp, fast forward to this past Friday when I finally cashed that bad boy in to keep my birthday week in full swing. Guys, it was AMAZING! To commemorate the occasion, this slideshow has 31 snapshots for my 31st birthday. So many things to let you know about, so I’ll just take it from the top. Dash and I made it downtown at about 2 p.m. and had some time to kill before our check-in at the Ace Hotel, so we set out in search of a late lunch. As luck would have it, Grand Central Market was within a block of the lot where we parked. Boom! That meant I could finally try out Eggslut. The name is kinda out there, but the food is simply divine. And it gets bonus points because there was no line! We feasted on their famous cheeseburger, which has (you guessed it!) an egg in it. A sunny-side-up sucker, to be exact. I wondered, will it be messy? Will all the flavors be balanced? Will this change my life? The answer to all these questions: yes, Yes, and YAAASS! Seriously, it was the jam. Can’t wait to visit the Market again and see what other treats await. After our quick bite, we hit up Bar 107 for a little sippy sippy and then made our way to the Ace. Upon arrival, we were greeted by the most stylish, friendly front desk agents, who made check in a breeze. We opted for the king bed on the 11th floor, as opposed to the queen on the 13th, because obvi. The room was legit! Guys, I got to see D’Angelo and The Vanguard live in concert at Club Nokia on Monday night with my pal, Becky, and it was EVERYTHING! I was delighted to have seen him perform on “Saturday Night Live” but, of course, that has nothing on the live show. If ever you had a doubt in your mind, D’Angelo’s still got it. Yes, that velvety voice greeted me like a warm hug. He’s promoting his new album, Black Messiah, which has some great tracks. My favorites that he graced us with that night were “Really Love,” “Ain’t That Easy,” “The Charade” and “Betray My Heart,” which was accompanied by the flyest sign-language choreo I’d ever seen. Temecula in May is usually warm and sunshine-y, but May 8 turned out to be an overcast, chilly day. However, my family’s love and excitement shone brightly, despite the weather that day. It was a big day for the Sabree/Ratcliff clan, as my youngest brother, Jamaal, got married to his fiancé, Breana. The rustic venue, Whispering Oaks Terrace, was quaint and we were very glad to find that the wedding would be taking place inside of the venue’s surprisingly intimate barn. This was a shabby chic dream, with white stringed lights, baby’s breath in mason jars, dim lights, white linen, wooden chests — the whole shebang. My brothers Robert and Karim were groomsmen, and nephew Jordan was the ring bearer. I’ll never forget how beautiful everyone looked and how much love filled the room. It was tangible. Long story short: My brother’s wedding day was incredible, and I’m so excited to see Jamaal and Breana grow as a couple. Welcome to our wacky, loving family, Bree! No take-backs. LOL. Pro tip: On a hot, sunny day (like the one we experienced on Tuesday), stop to refuel by grabbing a tasty Dole Whip Float (unbelievable pinapple-y goodness!) and heading to the Enchanted Tiki Room in Adventureland. It’s not the best thing since sliced bread, but you will appreciate the air conditioning, tap your toes to the rhythms permeating and even get a few giggles in laughing at the outdated animatronic birds. When was the last time you visited Disneyland? What’s your favorite Disneyland treat? Let me know in the comments section below! The ’90s called last weekend and I was so bout it-bout it! So I flew to Oakland and put on my “Damn Gina” tank, leopard-print stretch pants, high-top Pony sneakers and some door-knockers (it pays to be a pack rat!) — it was all to celebrate my pals Yvette and Thomas’ birthdays. Guys, the party was all that AND a bag of chips! I mean, no detail was spared, thanks to our lovely hostess, Edwina, who opened her stupid phat crib up to her home skillets, who proudly rocked acid wash denim, floral prints, overalls and shortalls, candy necklaces, chokers, flannels, high tops, glows-tick necklaces, crazy patterns and at least one commendable tail. I’m talking Ring Pops, Fun Dip, Jolly Ranchers, brown liquor in red party cups, a bangin’ playlist that included Snow’s “Informer,” ‘NSYNC’s “Bye Bye Bye” and E40’s “Sprinkle Me,” and everything in between. Seriously da bomb! You’re not gonna believe this, but special guests included a Fly Girl (from “In Living Color” — duh! ), Sidney (a.k.a. Wesley Snipes from White Men Can’t Jump), Da Brat, LL Cool J, Lisa Turtle, Kelly Kapowski, Blossom, the Fresh Prince of Bel Air and bourgie cousin Hillary, and Carlton. Oh, and figure skater Nancy Kerrigan and her nemesis Tonya Harding made quite an appearance — lots of “oh snaps!” were heard when they entered the building. I love a theme party and was geeked to see all the homies fully commit to it. I already miss by Bay Area boos, but I’m glad I have these photos and crazy memories to remind me of this glorious time. On that note, I’m outtie 5000! Thanks to Yvette and Crystal for these amazing photos, and a major shout out to Edwina and Thomas for making THE dopest ’90s party happen. Last weekend was filled with multiple occasions that called for celebration: my guy’s birthday, Valentine’s Day, President’s Day weekend (and, thus, a four-day weekend for me). Being that Dash and I share a love of train rides, we decided to set off on an adventure to San Diego, where we both grew up, via Amtrak’s Surfliner, which hugs the coastline and offers some amazing views. You can see a few of the sights we observed on Friday afternoon in the slideshow above: the Pacific Ocean, the Del Mar Fairgrounds, the Solana Beach and Old Town train stops, Downtown San Diego and more. But what’s even more incredible are the myriad scenes that I couldn’t quite capture on camera. The picturesque views conjured up daydreams, made me thank God for His creation and gave me a sense of peace. The lone egret resting in the marshland, seemingly with not a care in the world. The iconic red schoolhouse in San Clemente that, if done right, houses the creative imaginations of dozens of brilliant, precocious children. The amused elderly couples and awestruck toddlers waving vigorously at the passing train in Del Mar, as if it were a part of their weekly routines and that a very important person was on the receiving end of said gesture. The pristine bluff tops sprinkled with native plants of plentiful hues. The sitting ducks wandering about the lagoons. The eerie, solemn pet cemetery in Sorrento Valley that always weirded me out in my youth. The passing snapshots worth far more than these words of mine can convey. So I sit back and vow to enjoy the scenery on our ride home. I vividly recall visiting Los Angeles with my eighth-grade Spanish class. We took the Amtrak from San Diego to Union Station in Downtown L.A. and walked across the street to Placita Olvera, or Olvera Street, a historic Mexican marketplace. While there, we practiced our Spanish by ordering lunch and paying for tchotchkes in Español. Why I purchased a sombrero is beyond me, but a wonderful time was had by all. It’s been at least 16 years since I’ve been back to that culturally rich, vibrant, brick-paved plaza, which is a shame, really, since I’ve lived in L.A. County for more than eight years. Last Friday, my colleagues and I found ourselves near Olvera Street after attending a professional development workshop, so we took a short walk to the placita for a bite to eat. 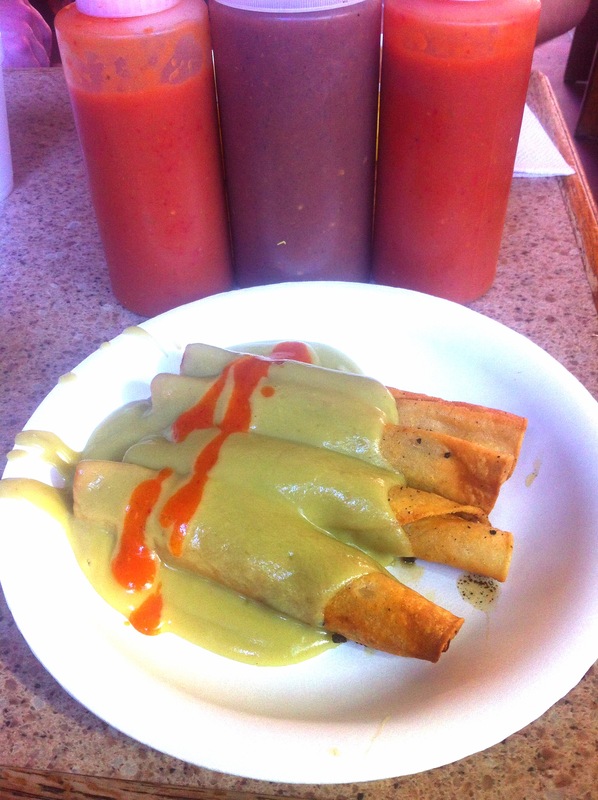 It was tough to choose from all the many options, but we settled on El Rancho Grande, where I feasted on these delicious taquitos with guacamole sauce. Their hot sauces were fire, too! After lunch, we walked around the various shops and saw so many things we wanted. 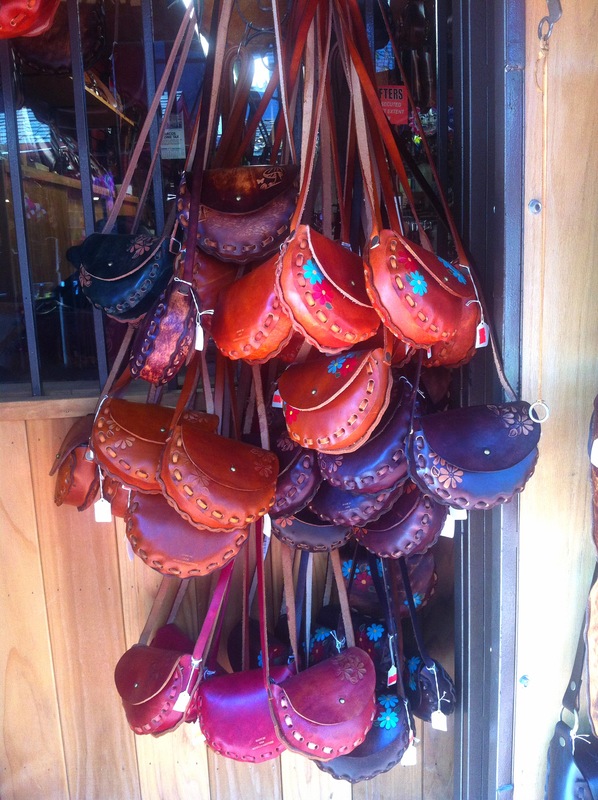 How darling are these leather purses? No doubt they’re authentic. See more of the sights from Olvera Street after the jump!